Preheat a chargrill pan over high heat. Alternately thread the salmon and zucchini onto 8 metal skewers. Place the peppercorns, fennel seeds and salt in a mortar and grind with a pestle until fine. Press into the salmon. Drizzle the skewers with the oil and cook, turning, for 6–8 minutes or until cooked to your liking. Place the rocket, fennel and lemon juice in a large bowl, season with salt and toss to combine. 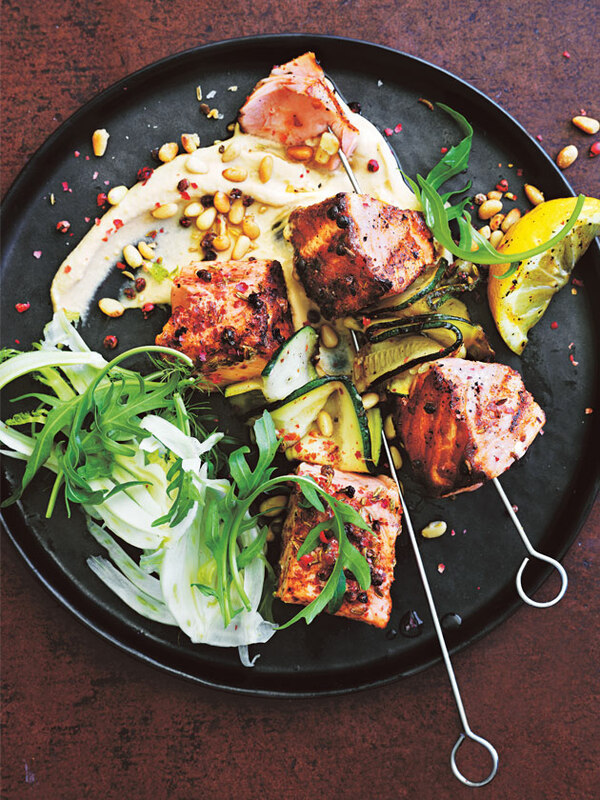 Divide the hummus between plates and top with the salad, skewers and pine nuts. Serve with lemon wedges. Serves 4.